The global car accessories market is reasonably populated with the leading companies in 2016 adding up for noteworthy share of the market. Major players have been spending in technological advancement, product innovation, and maintaining quality standards so as preserve their supremacy in the car accessories market. The major players active in the car accessories market are Cover craft Industries LLC, U.S. Auto Parts Network Inc., Star Automotive Accessories, Lloyd Mats, Hyundai Motor Company, Robert Bosch GmbH, JCA Fleet Services, Roush Performance, Renault, Classic Soft Trim, and Honda Motor Co., Ltd. among others. These players are set to augment the growth of the car accessories market in the near future. According to analysts at Zion Market Research, the global car accessories market was capitalized at USD 360.80 Billion in 2016. 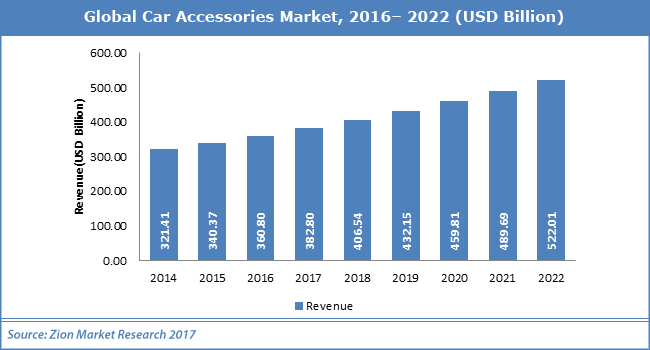 The global car accessories market is likely to cross almost USD 519.01 Billion by end of 2022, developing at a CAGR of almost 6.4% from 2017 to 2022. Analysts at Zion Market Research claim, “The car accessories market is likely to see considerable development in the near future.” Rising requirements for cars, growing inclination towards customizations of vehicle (particularly amongst the teen generation), and increasing sales of pickup trucks in developed nations are the main reasons expected to power the development of global car accessories market over the forecast period. As huge numbers of car accessories are accessible in the industry many of these are not consistent in quality. The goods are made from materials with poor quality. Thus, the availability of cheap low-quality car accessories and irregularity of quality of car accessories might hinder the development of car accessories market. The auto sector is continually bringing new tech such as biometric vehicle access, new lighting technology, and active window displays among others. This advancement in tech is likely to set new developmental opportunities for the car accessories in the years to come. For example, in June 2018, Rockford Fosgate DSR1 audio processor was launched In India. The Rockford Fosgate DSR1 enhances the quality of the sound over the stock version by connecting to the OEM factory-fitted system of the car. Such types of launches boost the car accessories market. Based on the product, the car accessories market is divided into torches, working lights, warning lights, appearance accessories, interior lights, driving lights, interior accessories, e-sets, gauges & instruments, lifestyle gadget, light module tuning, safety, vision products, stylish/ performance/luminaire tuning, gas & oil additives, appearance chemicals, retrofit air conditioner sets, solar powered HVAC systems, and others. Amongst all the product types, vision products & torches have in the highest demand, thereby boosting the car accessories market.